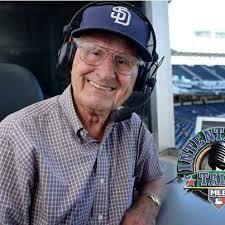 January 6, 2014 - Jerry Coleman, Lifetime Member of the American Sportscasters Association and voice of the San Diego Padres for over 40 years, died on Sunday, January 5th, after a brief illness. He was 89. A former second baseman with the New York Yankees for nine seasons, Coleman was named Rookie of the Year in 1949, earned the 1950 World Series Most Valuable Player award and won four World Series titles. Among his teammates were Joe DiMaggio, Yogi Berra, Phil Rizzuto and Johnny Mize. Twice during his tenure as a player, Coleman’s career was interrupted because of military service as a Marine pilot. During World War II and Korea, he flew 120 missions, received two distinguished flying crosses, 13 Air Medals and three Navy citations. Coleman made his broadcast debut in 1960, handling pre-game interviews for Dizzy Dean and Pee Wee Reese on CBS TV's "Game of the Week." Beginning in 1963, Coleman joined a Yankees radio team featuring Mel Allen, Red Barber, Joe Garagiola and Phil Rizzuto. In 1970, Coleman moved to southern California to host the Angels’ pre-game show, while anchoring the evening sportscasts of KTLA-TV. In 1972, Coleman became the voice of the Padres in the club’s fourth season. Coleman left the broadcast booth in 1980 to become field manager for the Padres, a stint that lasted just one year after he guided the club to a sixth-place finish. Coleman was a San Diego-area institution, with his trademark calls such as “Oh Doctor!” and “You can hang a star on that.” He broadcast two World Series and 18 League Championship Series. Recently, Coleman's broadcast schedule had been reduced to home day games. He also did a pregame interview with Padres manager Bud Black, who said Coleman was self-deprecating and preferred to talk about the Padres rather than anything he'd done with the Yankees or in the Marines. In 2005, Coleman received the Ford C. Frick Award from the Baseball Hall of Fame and was inducted into the National Radio Hall of Fame in 2007. In 2012, the Padres unveiled a statue of Coleman outside Petco Park. "Jerry Coleman left us in the same manner that he lived...graciously and without fanfare. I knew him for 45 years, never saw him change a step, consistently concerned and praising others, not himself. It won't ever be quite the same without him. Look up hero in the dictionary. His picture should be there." "Jerry Coleman was one of a kind. A great ballplayer, a great sportscaster, a great American and a great person. His sense of humor and passion for the game of baseball inspired many Padres fans, whether the team was winning or losing. What a great loss not only to baseball but to all sports fans. "My sincerest condolences to his wonderful family, his friends and his loyal fans." "We have lost a real American hero, a winning ballplayer, outstanding broadcaster and true gentleman with the passing of Jerry Coleman. I always looked forward to seeing Jerry when our teams got together. His friendliness, humor and love of the game were an inspiration to me. This is a huge loss for baseball, and my sincerest prayers and thoughts go out to his family, friends and Padres fans who got to hear him all these years. "Jerry also like to say that he and Ted Wiliams shared something else besides being pilots in WWII and Korea. He said, 'we both homered the last at bats of our careers at Fenway Park.' The difference, he said was 'Ted knew it was his last at bat...I did not.' (The HR came off Frank Bauman Sept 1957...Jerry's last regular season AB.) What a thrill it was for me to work with Jerry on the CBS Radio hometown inning in the 80's and 90's. "For all his accolades and his tremendous achievements as a war hero, player and HOF broadcaster, Jerry remained a truly humble guy and we all feel his loss." "Mr. Coleman was an American hero, lucky for us he was around, and personally I feel privileged of knowing him, and specially talking baseball with him. My deepest sympathy to his wife and all his family." "Jerry Coleman was an outstanding baseball broadcaster. I recall fondly the post-season lineup on CBS Radio in the day: Coleman, Ernie Harwell, Ned Martin, Gene Elston, John Rooney, and Vin Scully with Sparky Anderson on World Series analysis. What a lineup that was! We'll miss your outstanding calls Jerry!" ~ George Eichorn, Executive Director, Detroit Sports Broadcasters Association.